Finally, program a button that will let your users clear stamps and restart. Click on the button sprite. From the pen menu, drag out a clear block. When people look at your project, they won't see the clear block to click on. They will see the clear button. To let users click on the clear button to clear the screen, add a when this sprite is clicked event block on top of the clear button. To test it out, stamp a few things, then click on the clear button. You've completed your architect's tool box software. Now that you've programmed your architect software you might want to save the pictures it creates. 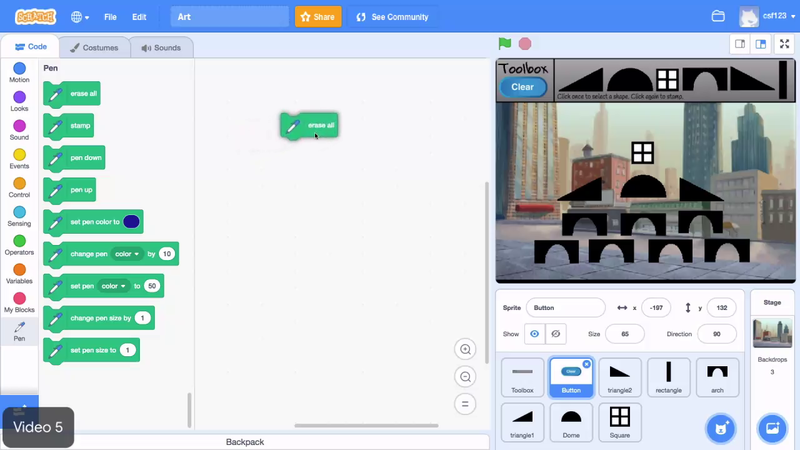 Scratch lets you save pictures you make on the stage in your projects. To do this, right click on the stage and click save picture. Scratch will ask you to name the picture and will tell you where to save it. In this example, the picture is named Tower and it is saved to the desktop. Choose a good name for your own picture and save it wherever makes sense. Before you go to the add ons, go to the project page to give your users instructions on how to use it. In the instructions box, type some instructions. This example uses, click once on the shape you want to stamp so it will follow your mouse pointer. Click again to stamp the shape. Use a when this sprite is clicked and clear block to allow the architects using your tool to easily clear the screen. Use the button sprite to clear the stamps. Clear the stamps when the button sprite is pressed.